Instructions for redemption. Not only is this section for the retailer to redeem, but at times has very important info for the consumer, it might states limits of use here or other info that they like to put in the fine print. 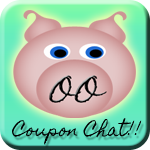 Also did you know that stores submit coupons and get 8¢ above and beyond the face value of the coupon? Think about it for a minute….. If a Walmart store accepts 1,000 coupons per day and they have 1,000 stores in the United states (this is just an example not actual numbers) then Walmart is taking in $80,000.00 per day in coupons! WOW!!!!! 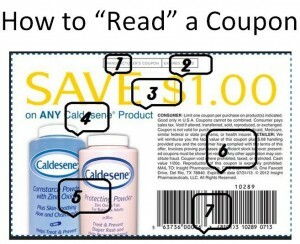 Bar code: This is how the scanner “reads” your coupon. A bar code that starts with a 5 will generally double (most of the time, unless otherwise stated) if your grocery store offers “doubles” (Check your local grocery to see if they double coupons) A bar code number that starts with a 9 will generally NOT double (most of the time).